I began learning at Bodyharmonics in January 2012 and finished toward the end of 2014. Six years on since the first day of my first course, I can say with some conviction that Bodyharmonics changed my life. The courses are truly life changing. They say knowledge is power; what I’ve learnt from Maria, Trevor and Graham has not only equipped me with sound knowledge, but has empowered me with the tools to help others. You will be amazed at what you can treat! There is a lot to learn so it is true to say the courses are intensive. They are very practical from day 1 as you are guided through the course by the team. At the end of every level/course you feel confident with your new skills and eager to put them to use. I would describe the team as professional, with a vast amount of information and a genuine care over your development. As I eluded to in my opening paragraph you will not walk into Bodyharmonics and leave with the same perception of health and well being. I too was once searching for the right centre, school or university to learn from. This is where my searching ended and yours should to! 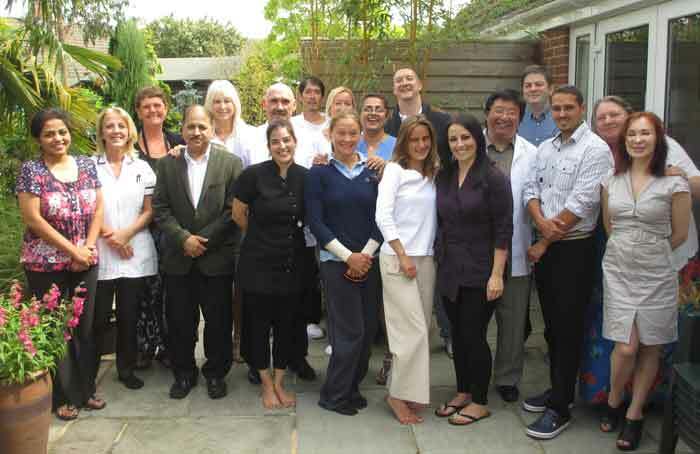 2013 – 2014 Acupuncture course review. Leon is standing next to Reyan Allowaid. Maria’s style of teaching suits my style of learning to the teeth. I fully enjoyed the entire course from beginning to end and made many friends in the process. The course was inspirational and requires one to be self motivated and prepared to spentd a lot of personal time to consolidate such vast amount of knowledge in such a compact course. Passing this course is not easy but if you can pass with distinction then you know you are an able acupuncturist.